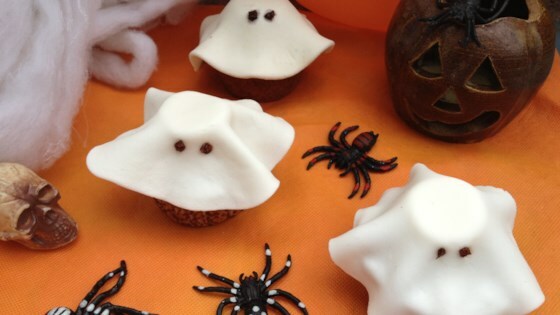 "I made these little fondant ghosts last year for Halloween as my creepy dessert and they were so easy and quick to decorate that I will make them every year from now on." Preheat oven to 350 degrees F (175 degrees C). Grease a 12-cup muffin tin or line cups with paper liners. Sift 1 cup plus 2 tablespoons flour, cocoa powder, baking soda, and salt together in a bowl. Combine sugar and butter in a large bowl; beat with an electric mixer until light and fluffy. Beat in egg and vanilla extract. Mix in flour mixture alternately with milk. Beat until batter is just blended. Bake in the preheated oven until tops spring back when lightly pressed and a toothpick inserted into the center comes out clean, 16 to 20 minutes. Remove from oven and cool on a wire rack for 15 minutes. Remove cupcakes from tin and cool completely, about 2 hours. Frost each cupcake with a thin layer of white vanilla frosting. Place 1 marshmallow half, cut-side up, in the center of each cupcake. Dust a work surface with confectioners' sugar. Pinch off walnut-sized pieces of white fondant; roll into thin circles that are slightly bigger than the cupcakes. Drape over the marshmallows so they look like ghosts. Poke 2 holes near the top for the eyes. Stuff 1 raisin half into each hole. See how to make little versions of this classic cake. I will make it again! Very fun and tasty. Made them with my grandkids this weekend. Super easy and came out great!